Born at Auxerre, Gaul, of Catholic parents he was also known as Germain; he studied at local schools and then law at Rome and became a lawyer. After he married, he was made governor of the Amorican border provinces of Gaul; in 418 was named bishop of Auxerre. He changed his life to one of poverty and austerity, building a monastery, dedicated to Sts. Cosmas and Damian on the banks of the Yonne, and endowing various poor churches in the diocese. [I was unable to find out when his noble wife died.] In 429, he and St. Lupus, bishop of Troyes, were sent to Britain to combat the Pelagian heresy which was raging there: they were most successful in restoring orthodoxy. On his way Germain stopped at Nanterre, where he met a young child, Genevieve, destined to become the patroness of Paris. One of the early lives of St. Patrick, Apostle of Ireland, tells us that he formed one of St. Germain's suite on this occasion. Tradition tells us that the main discussion with the representatives of Pelagianism took place at St. Alban's, and resulted in the complete discomfiture of the heretics. Germain remained in Britain for some time preaching, and established several schools for the training of the clergy. It was on this trip that occurred the famous incident in which Germanus is reputed to have saved a force of Britons from destruction by a superior force of marauding Picts and Saxons. He led the Britons to a narrow ravine between two high mountains, and when the enemy approached had the Britons shout "Alleluia!" three times. The echoes magnified the shouts causing the invaders to believe they were confronted by a far superior force, and they fled. It was at this time that Germanus Baptized many of the Britons in the army. On his return to Gaul, he convinced Auxiliaris, prefect of Gaul, to reduce taxes when he healed Auxiliaris' sick wife, returning Britain about 440 to combat Pelagianism once more. Again he was successful, eliminating the heresy, and founded numerous schools to teach true doctrine. When he returned to Gaul, he found that Aetius, a Roman general, had dispatched a barbarian army under Goar to put down a revolt in Amorica. Fearful of the savagery of the barbarian forces, Germanus persuaded Goar to desist and then went to Ravenna in an unsuccessful attempt to persuade Emperor Valentinian III to call off the attack. Germanus' effort came to naught when news of another Amorican uprising reached the Emperor. Germanus died on July 31 while he was still in Ravenna, July 31 450. His body, as he requested when dying, was brought back to Auxerre and interred in the Oratory of St. Maurice, which he had built. Later the oratory was replaced by a large church, which became a celebrated Benedictine abbey known as St. Germain's. This tribute to the memory of the Saint was the gift of Queen Clotilde, wife of Clovis. Some centuries later, Charles the Bald had the shrine opened, and the body was found intact. It was embalmed and wrapped in precious cloths, and placed in a more prominent position in the church. There it was preserved till 1567, when Auxerre was taken by the Huguenots, who desecrated the shrine and cast out the relics. It has been said that the relics were afterwards picked up and placed in the Abbey of St. Marion on the banks of the Yonne, but the authenticity of the relics in this church has never been canonically recognized. 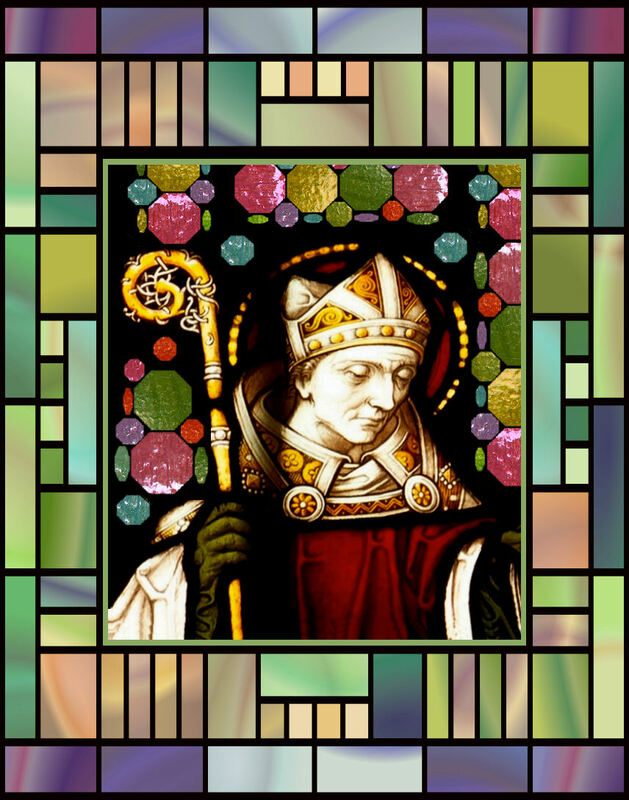 St. Germain was honored in Cornwall and at St. Alban's in England's pre-reformation days, and has always been the patron of Auxerre.